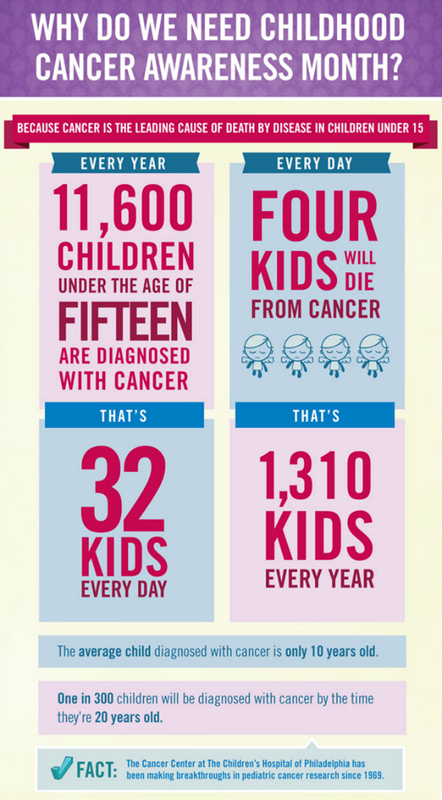 Although much of what is shown in this flyer may not be what automatically pulls at your heartstrings, like most things surrounding childhood cancer awareness, it is proof that there is more to be done to advocate for these incredibly brave children. Dollar signs and numbers aren't typically what make people feel drawn or connected to this cause, and those things are, by no means, the most important aspects. On the other hand, they are in large part the reason people need to become more aware of the issues accompanying these diagnoses. Cancer research has come so far in the past few decades and there has been tremendous progress and success in some of the new drugs and treatments that are now available. HOWEVER, most of these new treatments aren't meant for pediatrics. Subsequently, children are still receiving treatments from the 1950's, 60's and 70's. 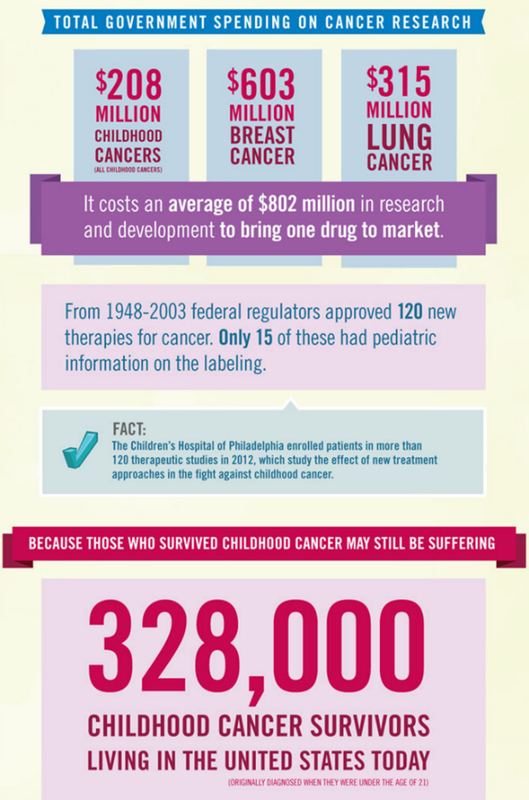 According to ACCO, in the past 20 years only ONE new drug was developed exclusively for pediatric cancer patients due, in part, to the idea that pediatric cancer is still too rare, and developing a new drug may not be "cost effective." Yet, another statistic from the past 20 years shows a 29% increase in the number of pediatric cases. I know I may not know ALL the in's and out's of why these numbers are what they are, but it doesn't make them any less heartbreaking and disappointing when I think about the sweet little angels that are waiting for them to change. 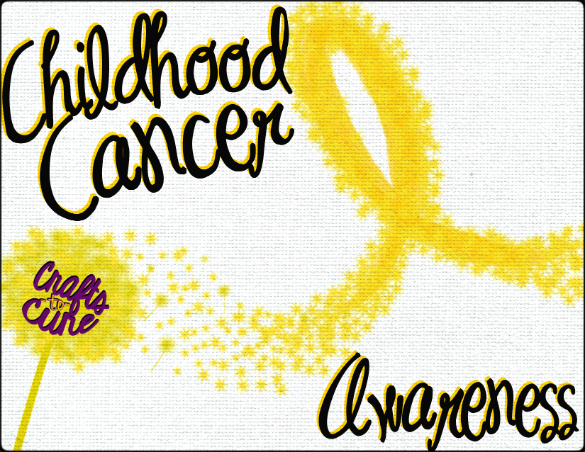 I can confidently say that you will only be left with a comforting warmth in your heart if you take the time to donate to a cause as precious as childhood cancer research... so I am hoping these tid-bits of info can at least spark some inspiration in you to learn more and make a difference! Donating money IS NOT your only option! There are so many other ways you can help make a difference in these children's lives, and I assure you they will make quite a difference in yours. Volunteering is one of the greatest ways to help support this cause, and there are several ways you can get involved. The Children's Cancer Research Fund has several options to help get you to a place where you can donate your time and wonderful energy...which in my opinion is sometimes just as great, if not better than, anything else! If nothing else I hope everyone can spend the month reflecting on how much more joyful, colorful and magical our world is because of the children among us. We owe not only them, but ourselves more time to relish in the midst of such purity.